This is a simple, rich tart. It’s sort of the Oregon version of a pecan pie but much less sweet and with a higher nut to custard ratio. You’ll need a 10-inch tart pan with removable bottom. Toast filberts in a 350-degree oven for about 20 minutes until very fragrant and a couple shades darker. Cool and then rub off as many skins as you can. Roll out the dough into an 11-inch or slightly larger round. Press the dough into a 10-inch tart pan with a removable bottom. Press the dough carefully into the base and up the sides and fold any overhang back over onto itself and integrate back into sides and set in the freezer for 5 minutes. Prick the base of the dough half-a-dozen times with fork. Place a piece of parchment paper or a buttered piece of foil onto the chilled dough. Fill the tart with pie weights or dry beans. Place the tart pan on a baking sheet and bake for 20-25 minutes until the crust is just beginning to color. Remove tart from oven and remove paper or foil and pie weights. Leave tart on the baking sheet. While the tart crust is blind baking make the filling. Heat the honey and butter in a heavy saucepan until boiling. Boil it hard for a minute and then whisk in the cream. It will bubble up significantly. Pour the caramel into a bowl. Whisk occasionally to speed cooling. When no longer hot, whisk in the salt, vanilla and whiskey, if using. Then whisk in the eggs one at a time. Turn the oven down to 325. Cover the bottom of the pre-baked tart with the filberts. 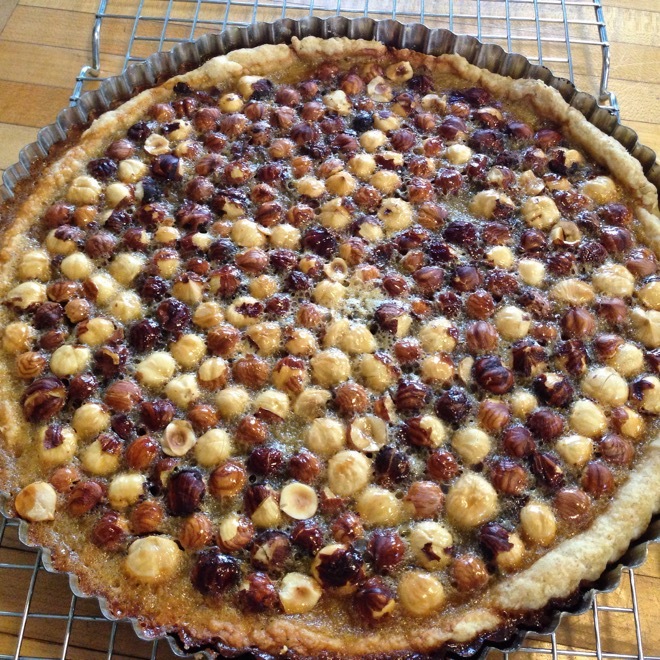 Carefully pour the custard over the nuts and put the tart, still on the baking sheet, in the oven. Bake for 20 – 25 minutes until custard is just set. Cool completely on a rack. People tend to give me food. 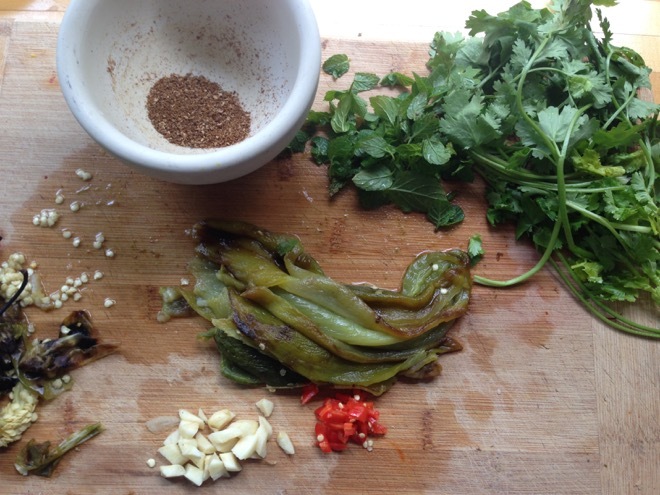 One friend always passes on his green onion tops after he uses the white parts for curry pastes. Last weekend I left a party with a jar of leftover Caesar salad dressing and a bag of extra croutons. A neighbor gave me a head of lettuce on its last legs the other day. I love these bits. They are the fodder for my cook-with-what-you-have kitchen and my deep-seeded joy in making something out of nothing. People seem to know that I’ll both use and appreciate them, which I in turn, appreciate! These gifts bestowed on me have me thinking both about how much many of us have and how simple it can be to eat well if you have access to the basics. There’s been a lot of writing and discussion about wasted food (or more commonly referred to as food waste though I think the semantics are important) this year. It is a huge and critical topic and I am beginning to think about how this blog and all my Cook With What You Have work, can more explicitly be a resource for decreasing waste and sharing our bounty with others. So, whether you have an appreciative friend or neighbor or want to get more creative yourself, I am eager to talk more about how we can use all we buy to the fullest and how we can share our bounty with those in need. Wishing you a very happy, resourceful and fulfilling holiday season! P.S. If someone on your gift list this season likes to cook or might be looking for inspiration in the kitchen, with vegetables, or likes to cook with their family, a gift subscription to the Cook With What You Have Seasonal Recipe Collection might just be the ticket! It won’t clutter anyone’s closet and it is the gift that keeps on giving. . . in the best of ways! Whether you use the classic Romaine or use the Escarole or any of the other hardy chicories that are this season’s salad greens here in the Pacific Northwest, this is a lovely dish to brighten up any holiday meal. I can eat just this for dinner. 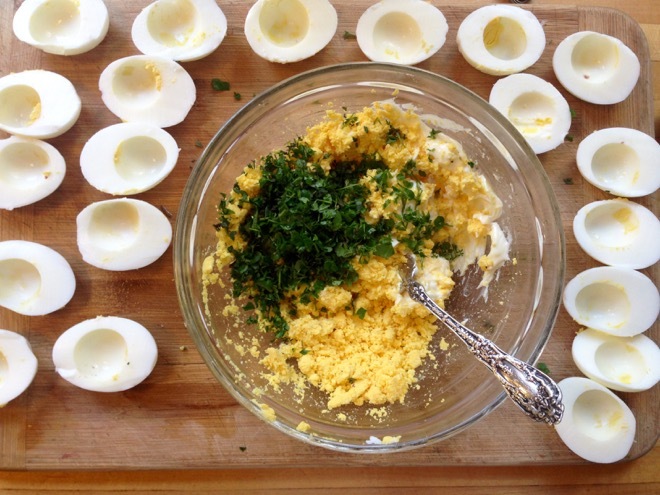 It’s tangy and fresh and rich from the egg in the dressing. The little bit of anchovy rounds things out without being overpowering. Good, fresh eggs from happy chickens will make it even better. You can either use a food processor or a mortar and pestle. If using the latter, put the garlic, anchovy, pepper and salt in it and pound it into a smooth-ish paste. Scoop the paste out of the mortar and put it into a bowl. 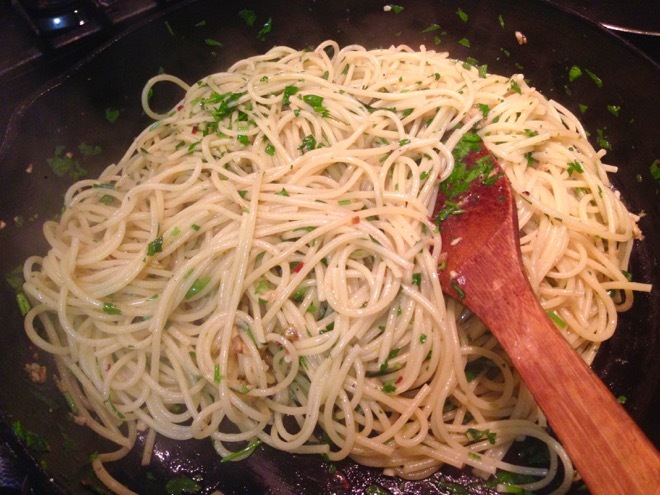 Then whisk in the lemon juice and egg yolk and then slowly add the oil and finally 1/2 cup of the Parmesan. If using a food processor start with the garlic, anchovy, lemon juice and salt and then add the ingredients in the same order. Stir the parmesan at the end after you’ve removed the dressing from the processor. 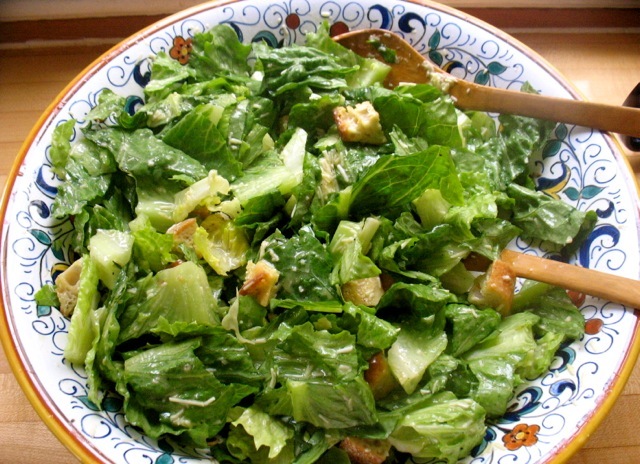 Toss dressing with lettuce, top with croutons and some more freshly grated Parmesan. These are the green bits of inspiration I’ve had all week thanks to my neighborhood farmers’ market. 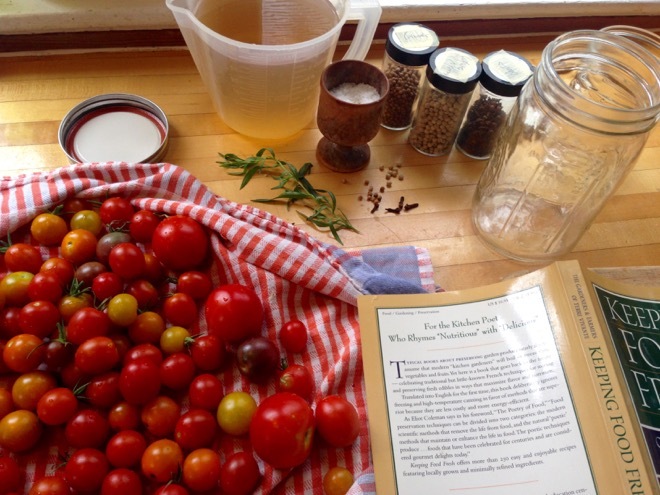 I document all these experiments as I continue to improve my Seasonal Recipe Collection to provide a deep, beautiful resource to anyone who likes to cook, wants to cook more, eat more vegetables, get out of a rut, save money, etc. And here’s a super short survey I’d love to have you fill out if you do subscribe to the Recipe Collection (and you’ll be entered to win a treat from me)! And if you don’t, maybe you’d like to subscribe or give a subscription to a friend as a gift that does not add clutter but makes for happy eaters! Now back to the green inspiration . . . A pot of white beans, mostly destined for a soup to take to a friend who recently had a baby, turned into a quick lunch with nothing more than broccoli, salt and a little olive oil. 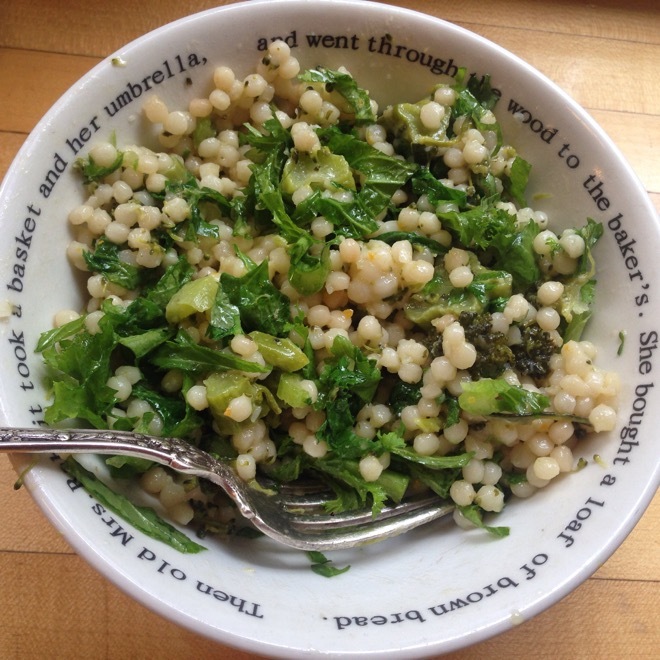 Israeli couscous with broccoli and sharp cheddar that I’d made for my son’s school lunch made enough that I could have it for lunch one day enlivened with thinly sliced, fresh mustard greens and more good olive oil. 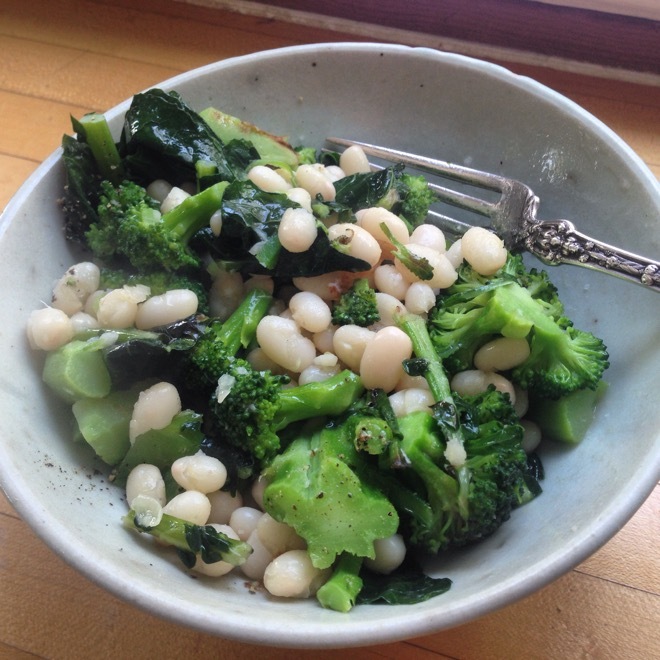 Said white beans were re-heated and also complemented by fresh mustard greens, hot pepper and olive oil. Testing a new savory tart crust recipe the filling became sautéed mustard greens, garlic, eggs, nutmeg and a little milk. Broccoli and cauliflower sautéed with cumin seeds and a bit of hot pepper and cooked until nicely browned and fragrant made a lovely side. 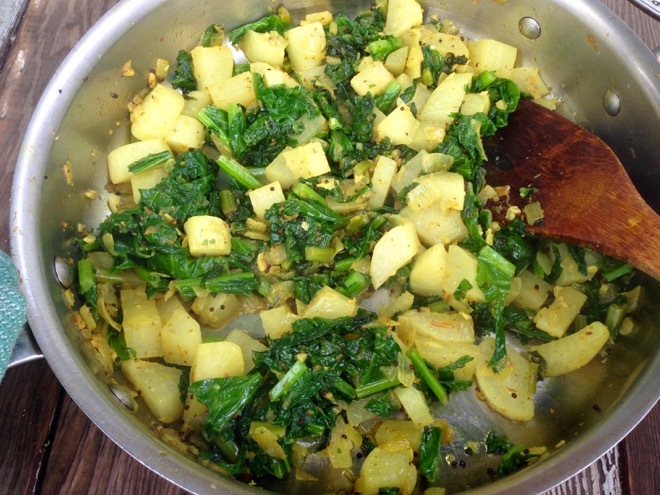 And finally today I made up a curry of daikon and mustard greens to populate the new “daikon” page on my Seasonal Recipe Collection. Daikon is fairly new to me and I’m finding all sorts of delicious ways to use this radish in the brassica family that is loaded with Vitamin C, calcium and also sorts of good things, not to mention plenty of crunch! These things all took minutes to make and were good, simple dishes. The vegetables were flavorful and bright and I’m reminded, as I am every winter, just what vibrant, green vegetables we have in addition to the fabulously flexible and nourishing winter squashes and roots. You never know when that cup of cooked beans or chunk of roasted butternut squash will come in handy. Little time to think about what to make for dinner and little time to actually make it? How does one turn random bits of already cooked ingredients into something delicious? Yesterday’s example . . . friend comes over for dinner but no real plan or time to be fancy. I had about 1 cup of cooked white beans and about as much bean cooking liquid, a rich, silky base for a soup. Also present, about 2 cups of already roasted butternut squash, some of it very soft and some of it still keeping its shape. I had a small chunk of celery root and I always have onions, potatoes and garlic on hand as well as veggie bouillon base (water would have been just fine since the bean broth was flavorful) in the freezer. 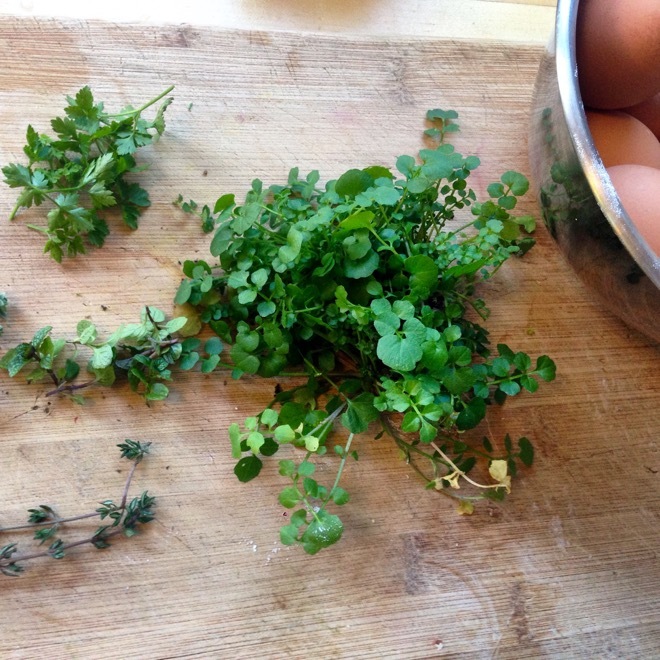 The garden offered up a handful of parsley and a few leaves of sage. 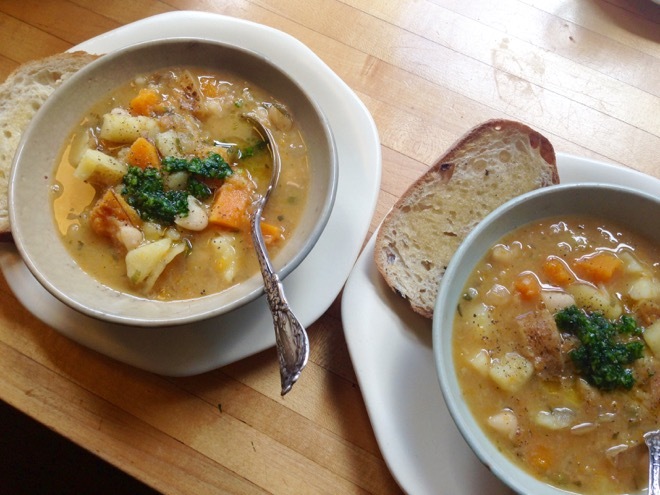 Soup is a handy format for on-the-fly, no-plan cooking but to make it good–in the absence of time for lengthy simmering–it needs more than vegetables, grain, broths, etc. 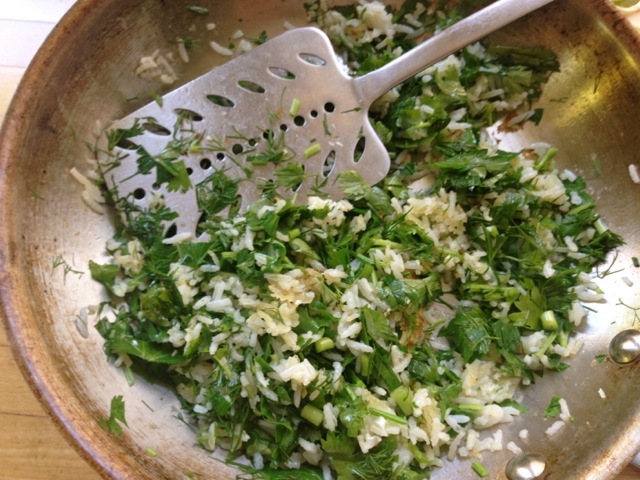 In this case a handful of chopped parsley and garlic clove and some salt, chopped/mashed into a paste and thinned with some good olive oil made it good. Sometimes soy sauce and/or fish sauce to finish does the trick, other times a slice of bacon, diced and added to the saute-ing onions does it. But to start, think of those beans and roasted vegetables as building blocks, really tasty and efficient ones, to make soup. Happy Cooking! This is merely a template for a nice warming bowl of soup. Adapt and substitute to suit your tastes and needs. Heat the olive oil in a soup pot over medium-high heat. Add the onion and cook, stirring often, for about 5 minutes until the onion softens. Add the celery root, potatoes and sage and mix well and cook for another 5 minutes. Add the beans, bean broth, squash and stock and bring everything to a simmer. Cover partially and cook for 10 minutes or until the potatoes are tender and beginning to fall apart. Meanwhile use the side of a chef’s knife to mash the sea salt into the minced garlic and then mix it around on the cutting board with the finely chopped parsley and make a rough paste. It doesn’t need to be uniform. Put it in a bowl and add a couple tablespoons good olive oil; it doesn’t need to totally emulsify, as you can see. 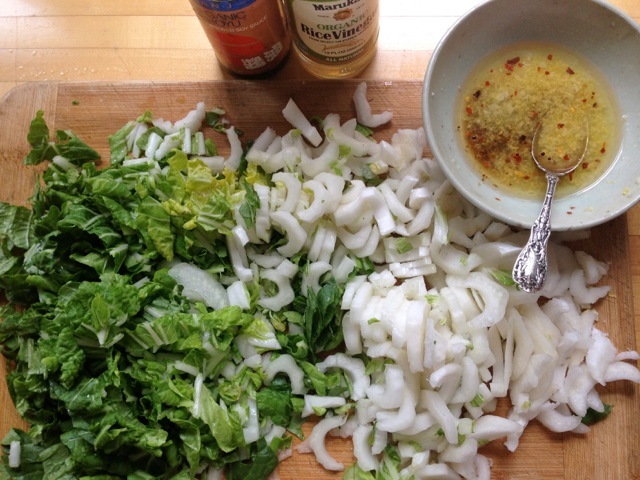 Taste the soup and adjust seasoning with salt and or a splash of vinegar if it’s bland. 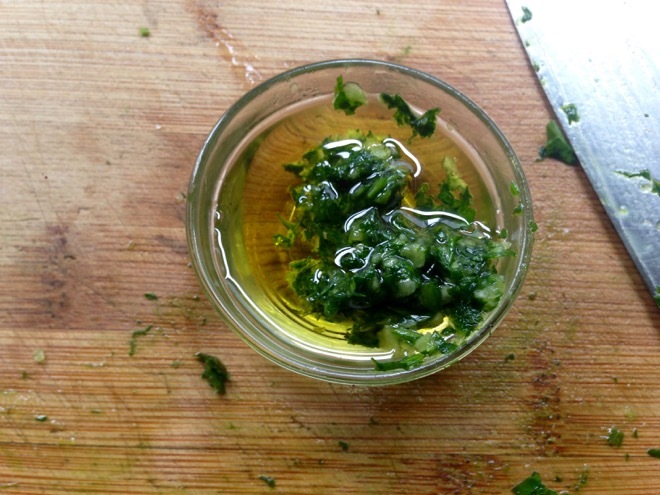 Serve hot or warm and top with the parsley garlic garnish. 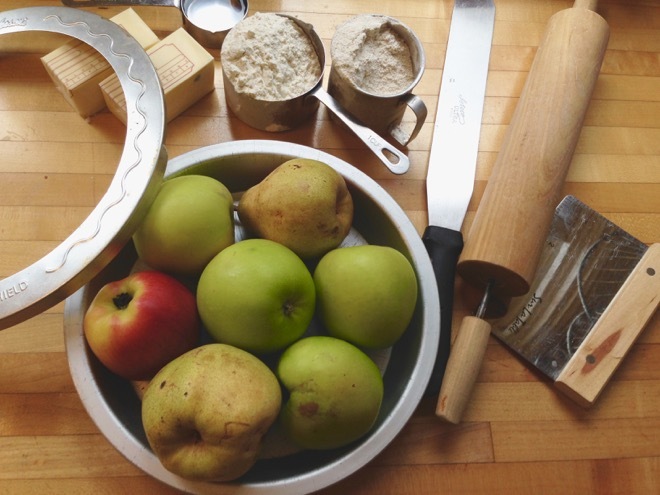 There are many apple confections that fall under this general title but I grew up with this particular one, a barely sweet apple tart really, and it will always have a special place in my heart and repertoire. It’s the same crust and preparation as the Zwetschgendatschi but I always make it in a half sheet pan. . . it’s wonderful for days and makes a fine breakfast, with or without whipped cream! Feel free to halve the recipe but then you have to deal with splitting an egg–or make the full crust recipe and freeze half the crust for a future use. I have been using Lonesome Whistle Farms pastry flour in this recipe with great success and have even added some of their Red Fife bread flour for wonderful flavor and texture. This most recent time I ran it under the broiler (for maybe 30 seconds too long, though I kind of liked the slightly burnt bites) for a little more caramelization. Watch it carefully if you do! Cream the butter, sugar and lemon zest, if using, in a large mixing bowl with a wooden spoon. Add the egg and incorporate well. Add the flour and salt and carefully incorporate it. I often resort to using my hands here. The dough should come together fairly easily and be soft but not sticky. Put the dough in the middle of a half sheet pan (13″ x 18″) or equivalent baking sheet or two. The sides of the half sheet pan are low enough that I can use my rolling pin to flatten out the dough and spread it around the pan. I use my hands to get it into the corners. This takes a little doing but you should have plenty of dough to cover it easily to a depth of about 1/4-inch. 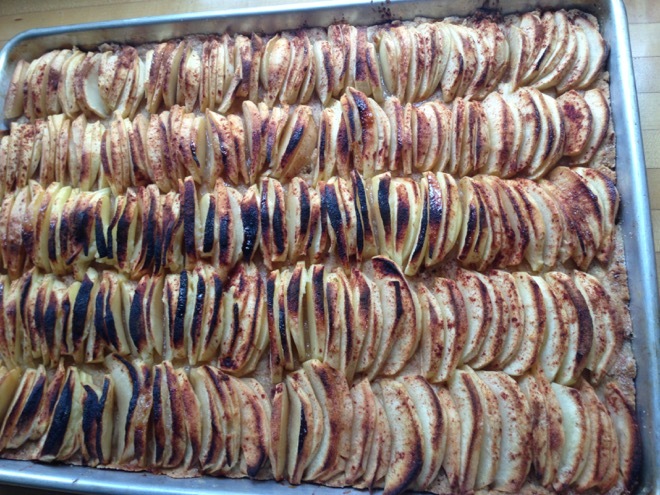 Now make rows of apple slices, fit tightly together, until the crust is covered. 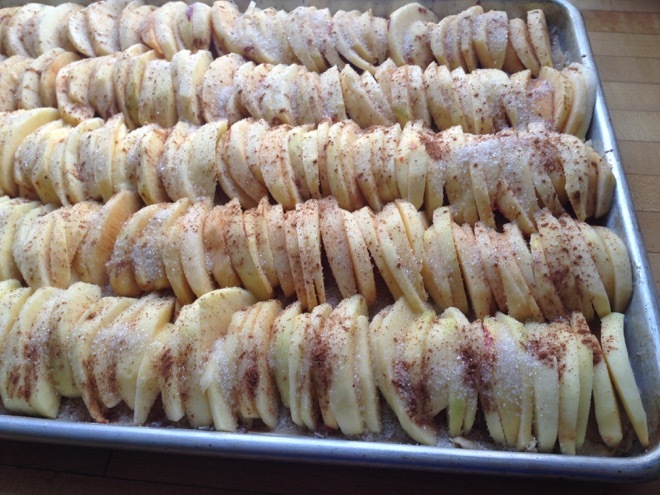 Sprinkle evenly with cinnamon and sugar and bake for about 40 minutes until the edges of the crust are browning, the apples are soft and browning and the sugar is caramelizing. Run under the broiler for just a minute or two if you want more color on the top–see headnote. Serve warm or at room temperature, cut into squares, with just barely sweetened whipped cream. 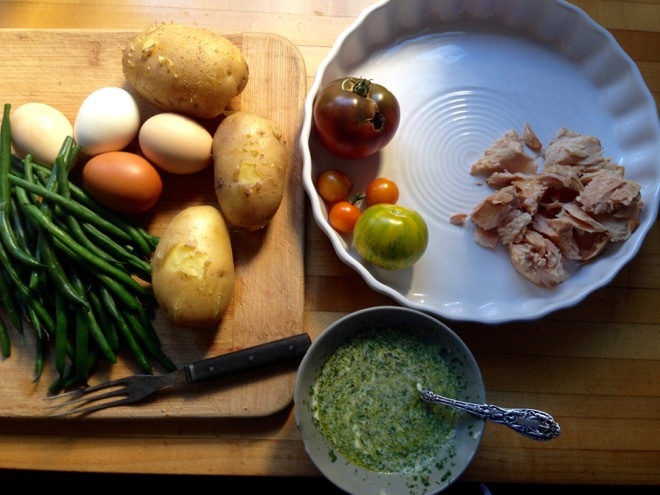 Posted on August 13, 2015 | by cookwithwhatyouhave | Leave a Comment on Can’t Keep Up with the Cucumbers?! I just barely am! And in great part it’s thanks to this simple, delicious technique. I’ve made versions of this quick-pickled dish for years but Lynne Curry’s version in Pure Beef is my latest inspiration. 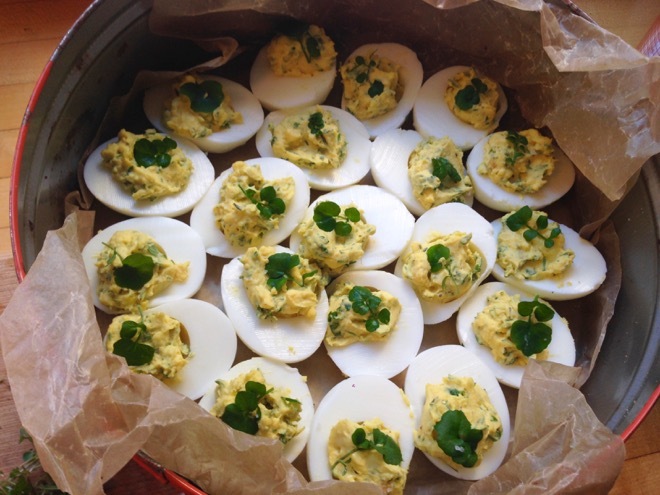 They’re delicious within 20 minutes of making and stay crisp and bright for a week. Whittle down that pile of cukes and find yourself snacking on these, putting them on burgers or any sandwich, enjoying them with rice or grilled tofu. This is perfect alongside a good hamburger or some thinly sliced flank steak or meatloaf (as Lynne does) or with rice or other grains or seafood or just as a snack. Slice the cucumbers in half lengthwise and use a teaspoon to scrape out the seeds and discard. 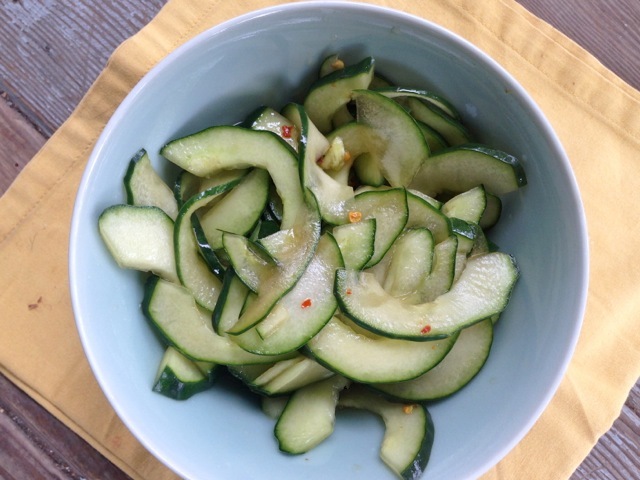 Slice the cucumber haves very thin on the diagonal and put them into a bowl. In a separate bowl, whisk the rice vinegar, sugar, soy sauce, salt and pepper flakes until the sugar dissolves. 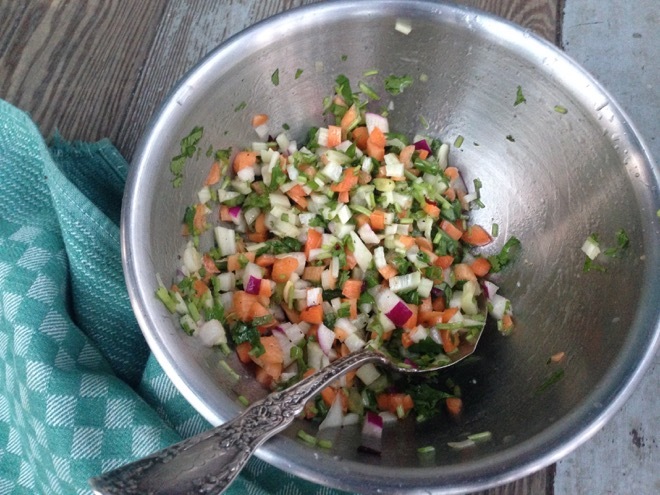 Pour the dressing over the cucumbers, stir, and let the flavors develop at room temperature for about 20-30 minutes. Store in the refrigerator for up to a week. Henry ran off the path in to the woods just a few days ago and returned with an apple in his mouth. He loved fruit. 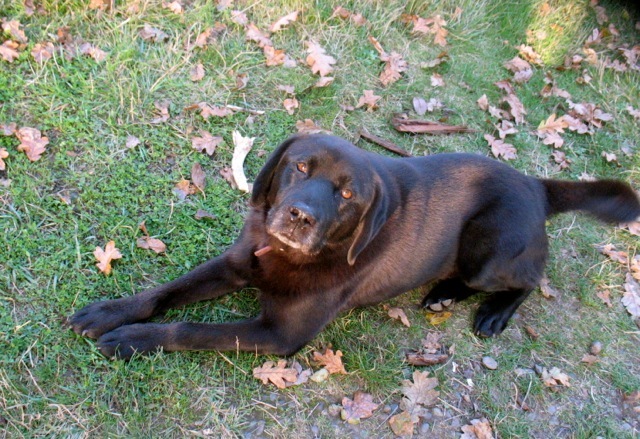 He was my mother’s faithful companion for almost 15 years. Henry, whom my mother referred to as a puppy his whole life, decided it was time to call it quits yesterday. He was buried with a big, sweet Gravenstein apple. He lived a glorious life out in the woods and loved my mother so. In his old age he’d bark incessantly if someone was talking to her and keenly felt the competition of the new grand child in the house. He stuck close to her right heal most days. Henry you will be missed! 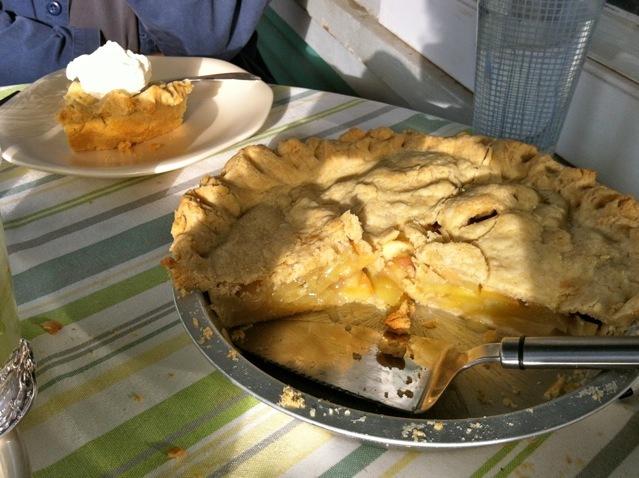 Go eat a beautiful piece of fruit in his honor or make a peach cobbler or an apple pie! The CSA share comes every Tuesday evening which means Tuesday dinner is the use-up-last-week’s share night. 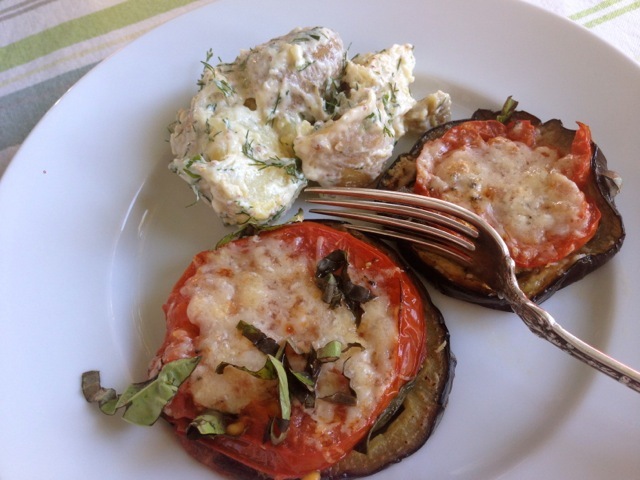 Tonight that meant one lovely globe eggplant and two tomatoes. 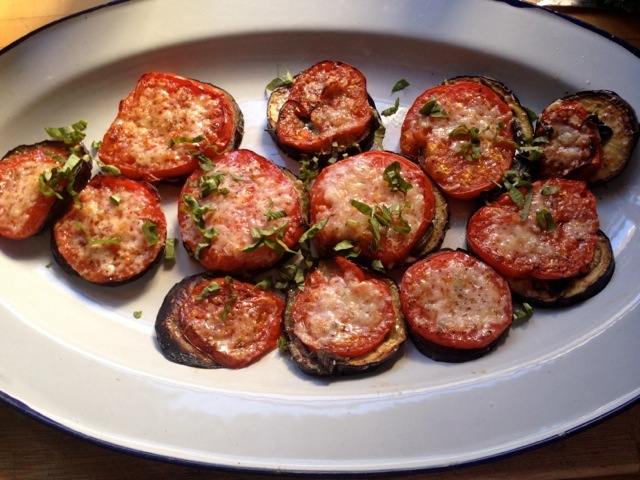 Time was short so I browned eggplant rounds in the cast iron pan, topped them with whole basil leaves, slices of tomato, salt and olive oil and broiled them until the tomatoes softened and started bubbling, then I topped them with grated Parmesan and passed them under the broiler for another minute or two. It’s only a slight stretch to say that we got individual eggplant Parmesan rounds in a matter of 15 minutes. It’s a keeper in any case. I’m sure a mix of oregano and basil would be good too and of course a more typical preparation would have used thick slices of mozzarella but I loved this version. P.S. 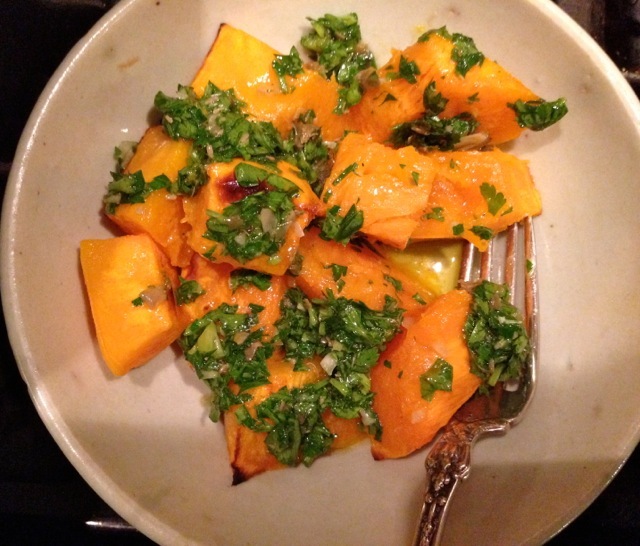 I just added my 600th recipe to my Seasonal Recipe Collection and am proud of what this resource has grown in to. Subscribe if you’d like to have access to all these recipes and tips and ideas to keep your table full of home-cooked goodness all year long. Slice the eggplant into 1/2-inch thick rounds. Heat a little olive oil in a large skillet. Cook the rounds, sprinkled with salt over high heat until brown on both sides, about 5 minutes for the first a bit less for the second side. Put the browned rounds on a baking sheet. 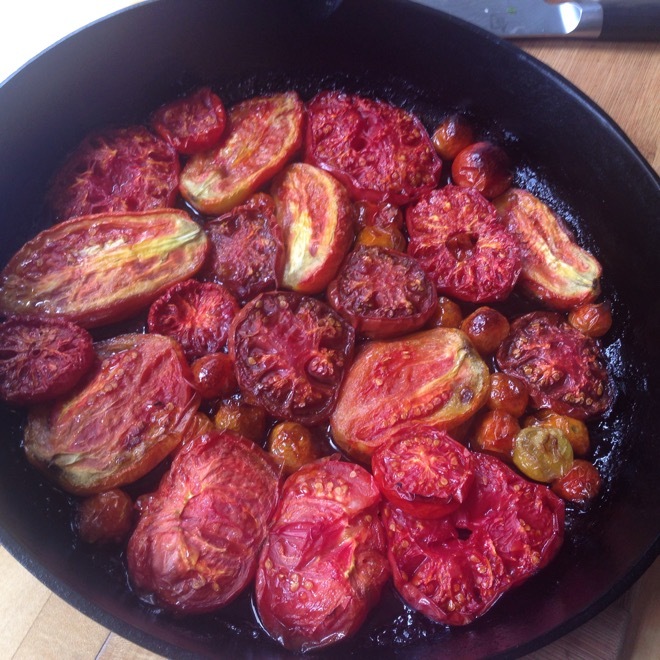 Top each round with a few basil leaves, then a slice of tomato, a sprinkle of salt and drizzle of olive oil. Set the pan under the broiler and broil until the tomatoes have softened and are bubbling a little. Remove from the oven and divide the Parmesan between all the rounds. Return to the broiler for another minute or two until melted and browning. Garnish with chopped basil and serve. 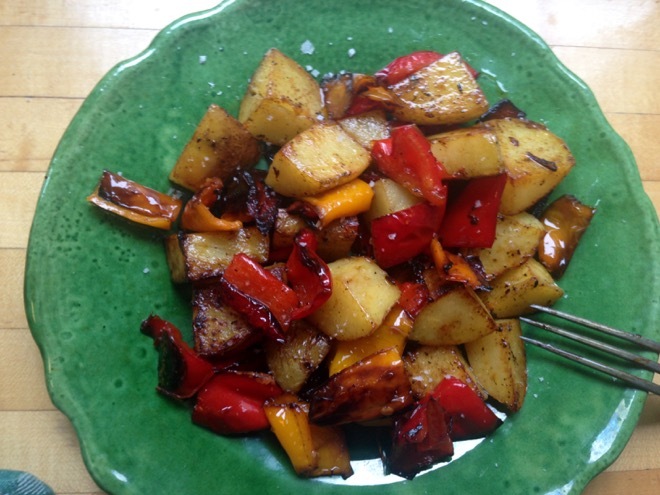 Posted on June 27, 2015 | by cookwithwhatyouhave | 1 Comment on Vegetables in Quantity! Let’s say you look up bok choy recipes, for example or recipes that use parsley, you’ll find a huge variety of course but many, if not most, will call for 2-4 cups of sliced bok choy or 2 tablespoons of parsley or maybe a full bunch if you land on tabbouleh. If you are a member of a CSA or have a vegetable garden or shop regularly at a farmers’ market these recipes, as written, may not do you much good. If you get the CSA I do (and LOVE!) 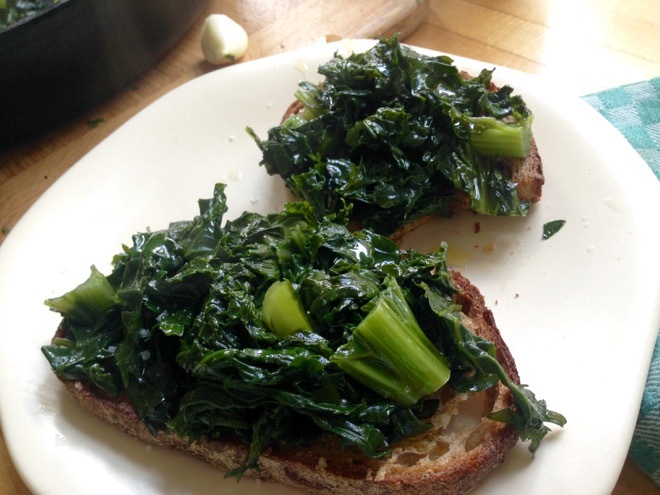 you may get 2 large heads of bok choy that would translate to 8 cups sliced, each, and 2 robust bunches of parsley. That’s how these things grow and are best distributed at certain weeks out of the year. Or cabbage, another perfect example… sauté a lot of cabbage in a huge skillet with nothing but olive oil and salt and then eat it and report back. I bet you can enjoy/devour a lot more cabbage (of any kind) than you might think in one sitting. Of course many of the vegetables, when cooked or dressed, reduce their volume several fold so you won’t necessarily be looking at a mountain of vegetables on your plate, though that’s never a bad thing for me! I love eating vegetables in this quantity–it moves them to the center of the plate. And of course that’s how most health gurus suggest we eat but I don’t always see this reflected in recipe writing. It is changing and folks like Heidi Swanson of 101cookbooks.com and Yotam Ottolenghi and Bryant Terry and many others have been leading the way on this approach for a years actually. 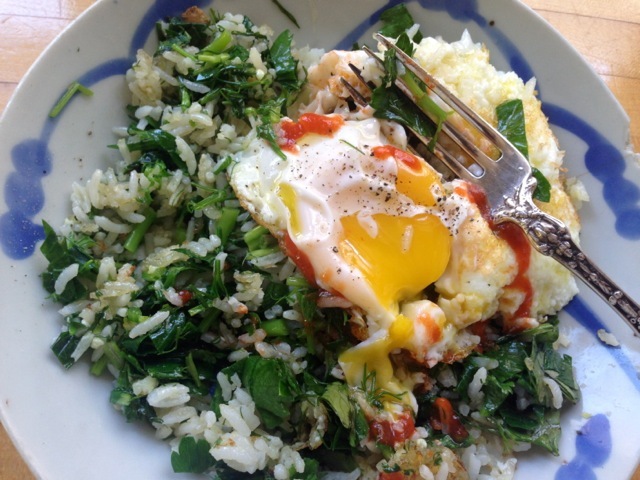 So today, as I create yet one more recipe for bok choy (which I have come to love because of having a CSA for years) I will let it shine with a simple dressing and find something to round it out, but it matters not much–an egg, a bowl of rice. . . . And if you’re ever at a loss for what to do with that gorgeous bouquet of parsley I just noticed that I have 40 recipes using parsley on my Seasonal Recipe Collection. So if you get a CSA or have a garden or generally have access to produce in this quantity, thank your lucky stars and triple the quantities of vegetable or herb often noted in recipes and enjoy all that veggie goodness at the center of the plate! Heat the coconut oil in a wok or large skillet until very hot. 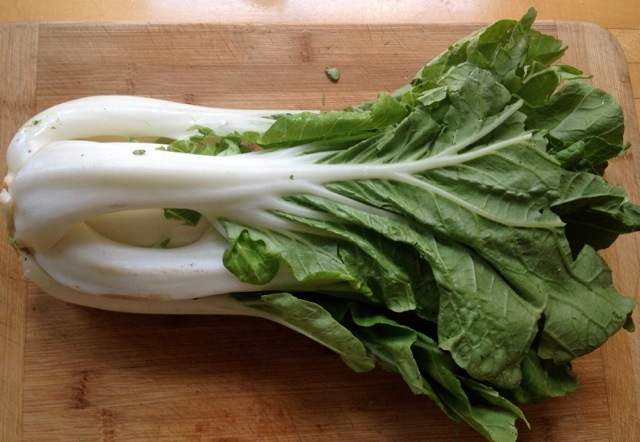 Toss in the bok choy stems and a few pinches of salt. Cook over high heat, stirring regularly, for about 2-3 minutes until the stems are softened but still have some bite. Add the leaves and cook for 30 seconds more. 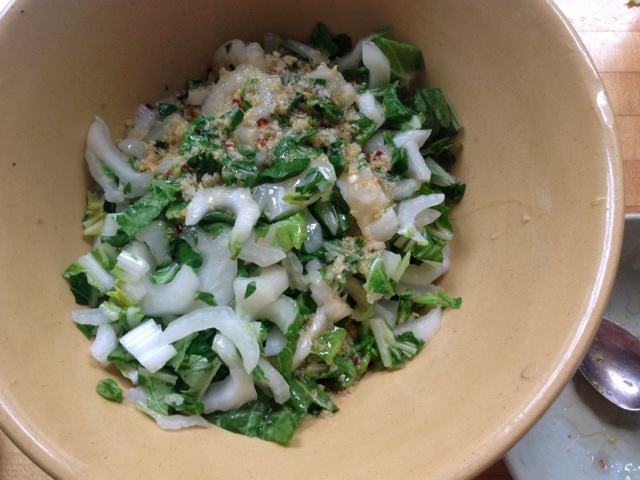 Put the vegetables in a bowl and mix in the dressing. A fair amount of liquid (combination of dressing and liquid from vegetables) will accumulate in the bottom of the bowl and it’s delicious and rice soaks it up well! 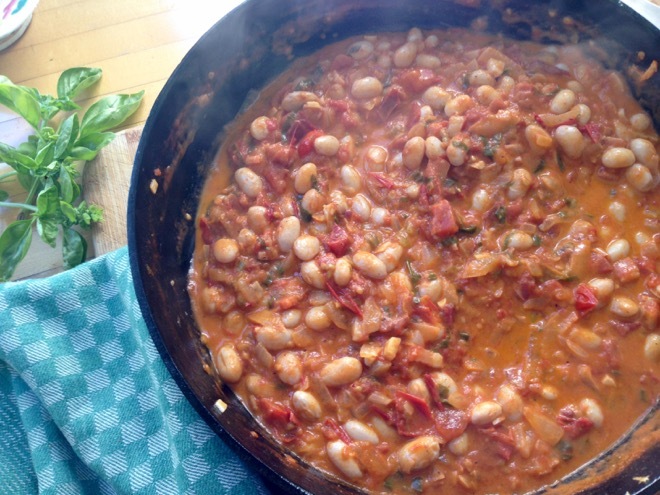 Posted on June 9, 2015 | by cookwithwhatyouhave | 11 Comments on The Bean Challenge! 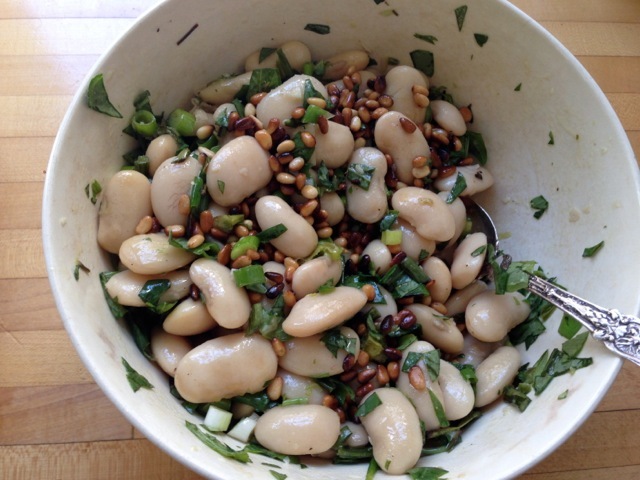 Corona beans (Rancho Gordo Beans) with roasted garlic scapes, pine nuts and parsley, scallions & lemony vinaigrette. It’s hot in Portland, Oregon, very hot, this week. Every summer (earlier this year than usual!) I have moments where I’d rather not be in the kitchen from 5-7 pm. Much of the year I’m happy to be but not when it’s really hot. What does this have to do with beans? 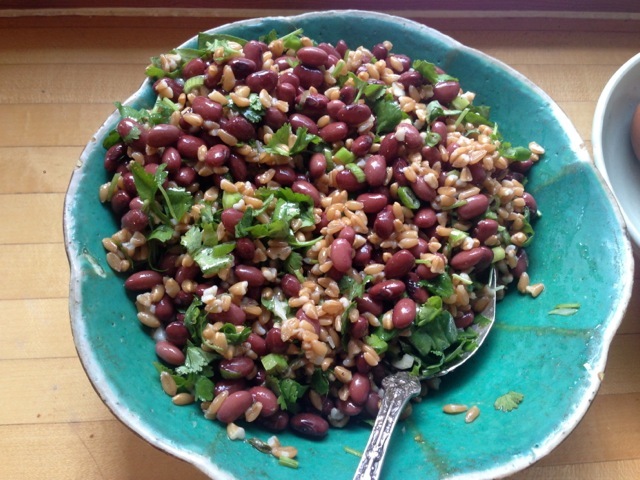 Domingo Rojo beans (Rancho Gordo) with farro and cilantro and lemony vinaigrette. I typically put a big bowl of dry beans out to soak in the evening (I do this year-round) and then in the morning before I get breakfast and school lunch ready I drain the beans, cover with fresh water, add a few aromatics and turn them on to cook. By the time we head out the door for school the beans are done (more details below). And that means I have the base of many a meal cooked before it begins to get truly warm in my kitchen. 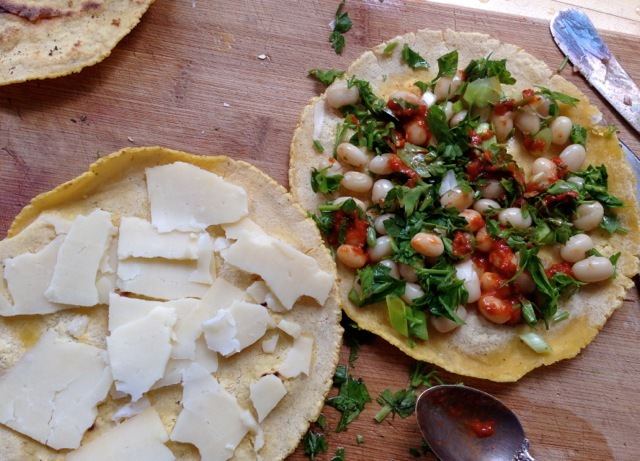 Zolfino beans (Ayers Creek Farm) with harissa, parsley and sharp cheddar. Those beans then turn into quesadillas or tacos of all kinds; salads, beans and rice (the rice often having been cooked at some earlier time to and just needing to be reheated), quick chili, soups and dips. Yes, there’s some cooking involved to make them meal worthy but it’s pretty simple and when you have home-cooked beans and their attendant flavorful broth much of the work is done. There are many more bean recipe on the Seasonal Recipe Collection! 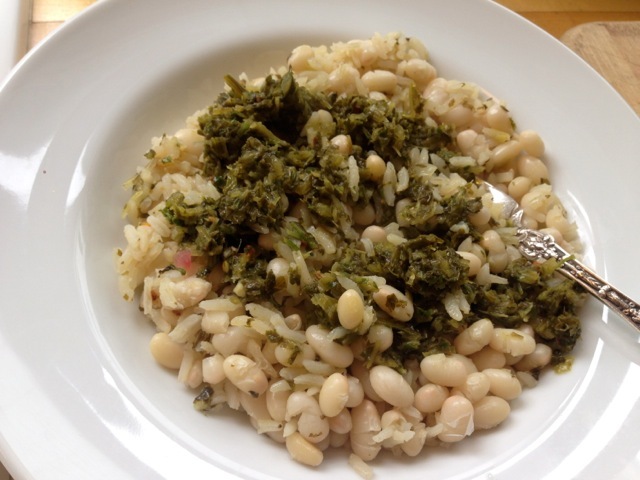 Purgatorio Beans (Ayers Creek Farm) with spicy green sauce and rice. So, the challenge is to cook a pot of beans, a new kind maybe, just for fun and tell us about in a comment here. 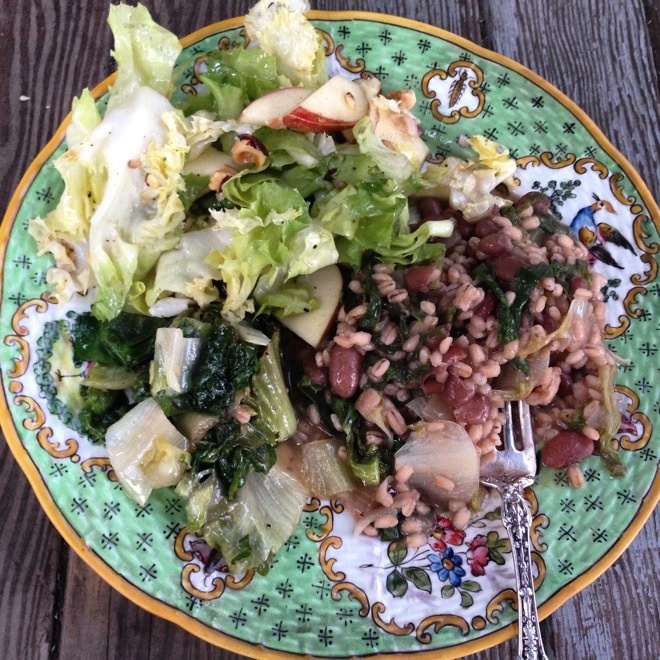 Let’s savor the simplicity, flavor and flexibility of beans in the summer! 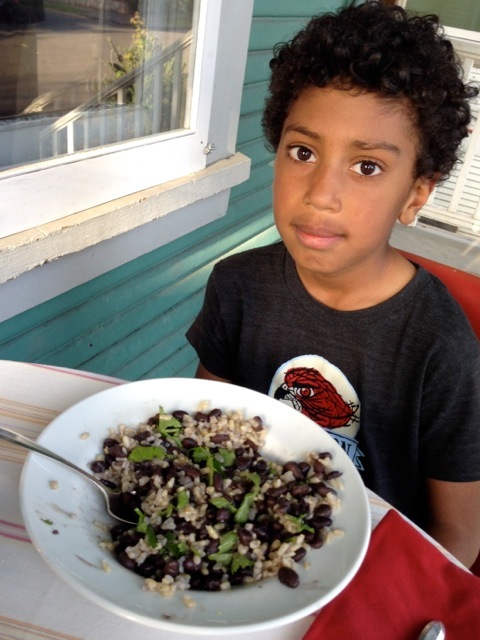 Black turtle beans (Sun Gold Farm) with brown rice and cilantro and my lovely son who loves rice and beans. 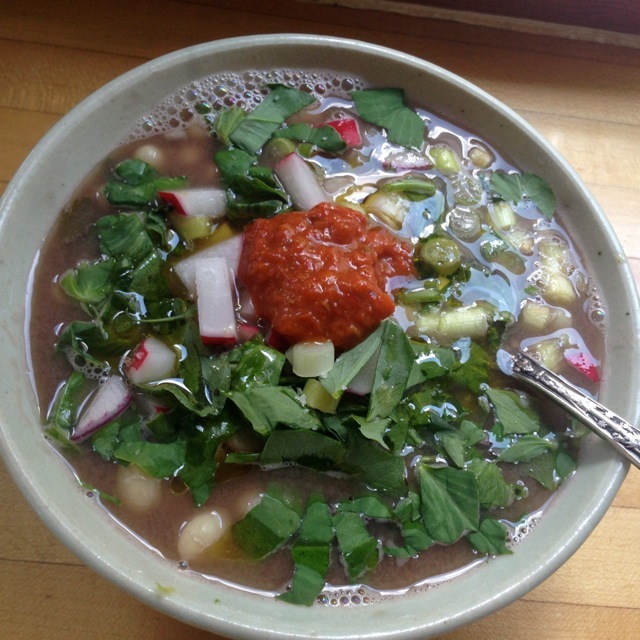 Pinto beans (Sun Gold Farm), Mayacoba beans (Rancho Gordo), bean broth, herbs, radishes, harissa. 1) Cook a lot of beans at once since they freeze so well, once cooked and covered in their cooking liquid. That way you have them on hand for quick meals when you’re short on time–just try to remember to put them out to thaw on the counter in the morning or the night before. 2) Let the beans cool in their cooking liquid for at least 1-2 hours. This vastly improves their flavor and texture. You do not need to refrigerate them while they’re cooling. Just leave them in the pot on the stove (with burner off) until they’re cool. 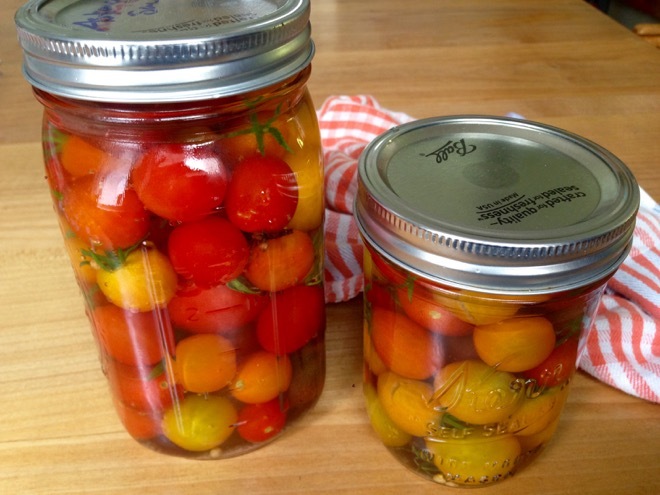 Then refrigerate what you think you’ll use up in 5 days and freeze the rest. Keep as much of the cooking liquid as you can–it’s wonderful in soups, as a broth on its own, to loosen up beans when making a spread or refried beans, etc. and it also protects them in the freezer. Place dry beans in a bowl covered by about 4 inches of cold water. Soak over night or 6-8 hours. Drain beans. Place soaked beans in a large pot and cover with cold water by several inches. Add a couple of whole, peeled garlic cloves, a bay leaf and a chunk of peeled onion. Bring to a boil, turn down to a simmer and let cook covered until the beans are tender, stirring occasionally (this helps prevent some beans from softening before others.) I add salt towards the end of the cooking time and when you do add salt, be generous, as in at least 1 teaspoon sea salt for every 1 1/2 cups or so of dried beans. They will likely need more still. The time it takes for the beans to cook will vary depending on the kind/size of bean and the freshness of the dried beans. Pinto and borlotti types typically take about 30-35 minutes, smaller white and black beans as little as 20-25. Let beans cool in their liquid (see above) and then use, freeze, etc. If you’re freezing some, fill your container with the beans and then ladle in the cooking liquid until the beans are covered. Cooked beans also keep in the fridge for 5-6 days and for several months in the freezer.